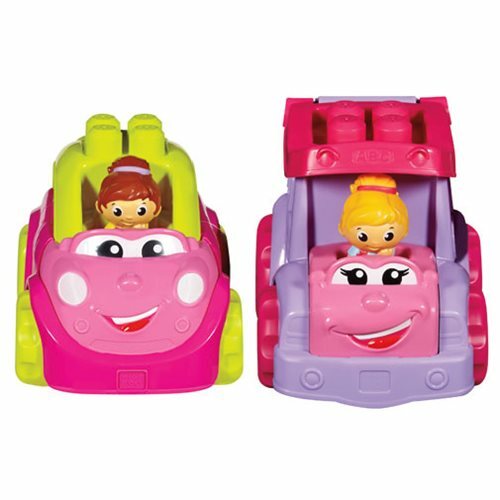 Your little driving fan can build their own collection of rolling friends with the Mega Bloks First Builders Lil' Vehicles Pink Vehicle Case! These friendly vehicles feature smiling faces and come with a cute Block Buddy driver and stackable blocks for building anything you imagine! Featuring a design that makes it easy for small hands to grip, each vehicle comes with a compartment for storing your blocks once playtime's over. The Mega Bloks First Builders Lil' Vehicles Pink Vehicle Case contains 4 individually packaged vehicles. Contains 6 pieces. Ages 1-5.